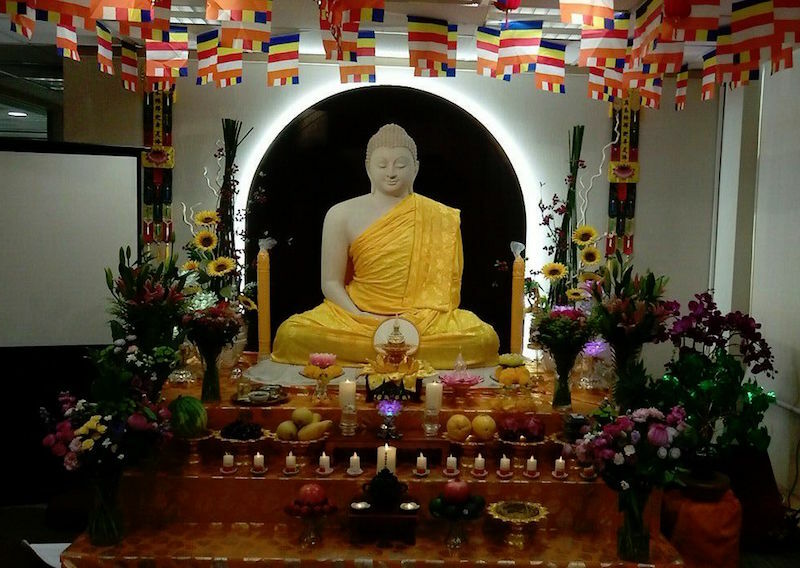 On 27 May, I was in the Buddha-Dharma Centre of Hong Kong (BDCHK), Hong Kong, to celebrate Vesak. It was the weekend, with lay Buddhists from diverse backgrounds: including local Hongkongers, Mainland Chinese, Bangladeshis, Sri Lankans, and Thais. Devotees who came to BDCHK on this special day were dressed in white clothing. Twelve Buddhist monks from the Mahayana and Theravada traditions, including yours truly, were present and in front of us, lay devotees were seated on cushions spread on the floor. Vesak is the most Buddhist religious festival in the world. It marks three important events of the Buddha’s life: his birth, enlightenment, and demise. The Vesak celebration started at ten o’clock in the morning. First, the householders accepted the five precepts as part of the ceremony conducted by Prof. Ven. Dhammajoti, director of BDCHK. We all continued with a long period of chanting in Chinese by two Mahayana monks, and subsequently in Pali by Theravada monks. We paid homage to the Buddha, the Dhamma, and the Sangha, and offered of food, flowers, incense, and lamps to the Buddha. Ven. Dhammajoti drew the devotees’ attention to the significant of Vesak. Though he is a Theravada monk, he emphasized a non-sectarian outlook, as he also believes that a non-sectarian approach is a meaningful way to prorogate and develop Buddhism, since all mainstream schools hold the core teaching of the Buddha. Speaking of Early Buddhist teachings—from the most ancient days, centuries that have been lost to writing itself—he clarified that Indian Buddhism is the root for all schools of Buddhism flourishing throughout the world, including Mainland China and Hong Kong. Before closing the session, we shared the gathered merit to family, friends, strangers, and all sentient beings. We then bathed the Buddha by pouring scented water over an image of the infant prince Siddhartha. The householders offered food to the monks. In the afternoon, the few people who had taken refuge in the Theravada tradition under the guidance of Venerable Dhammajoti as a means of committed to following the teachings of the Buddha. The first time I celebrated Vesak in Hong Kong was in 2013 at Wang Fat Ching She, a Buddhist temple. 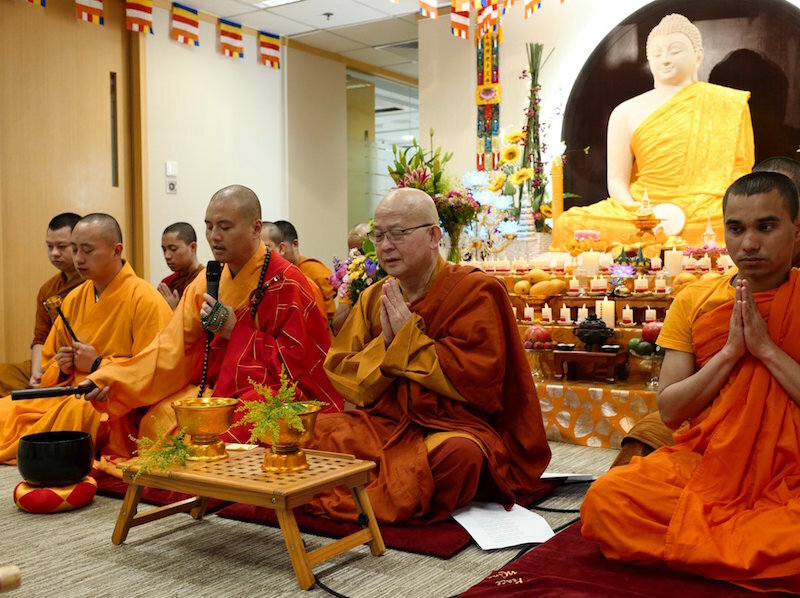 Along with Venerable Dr. Dhammapala, a Malaysian Theravada monk, and some others, we organized a ceremony attended by monks and lay Buddhists from Hong Kong and beyond. I consider Hong Kong a place for all Buddhist practitioners regardless of sectarian affiliations. Hong Kong was not a popular territory for Theravada Buddhists until the 1970s, when a small contingent of Theravada Buddhists were acknowledged by the Hong Kong Buddhist Sangha Association. Since the 1990s, Theravada Buddhism has been rapidly developing due to interest in Theravada meditative practices. The Centre of Buddhist Studies of the University of Hong Kong, where I am currently doing my PhD research in Theravada Buddhism, is playing a significant role in exposing people to Theravada. Over the last few years, BDCHK has served both the Buddhist and academic (Buddhist Studies) community. After Ven. Dhammajoti retired from HKU in 2015, he continued to propagate Buddhism by establishing BDCHK. BDCHK offers academic programmes in Buddhist Studies, including Postgraduate Diplomas, MA, MPhil, and PhD degrees, as well as special courses in both Chinese and English under the auspices of the University of Kelaniya, a university in Sri Lanka with a celebrated Buddhist Studies faculty. BDCHK and Hong Kong Buddhism is unique in the world community of Buddhists. We might not necessarily practice prominently in public avenues, but not only are we living in harmony and peace, but we are also helping to shape the very future of Buddhism in our active and vibrant city.